Founded in 1989 by the owner Ron Tharp and later incorporated in 1995, Tharp's Ltd., d/b/a Tharp Brothers has become a proven leader in the underground utility contracting industry. With over 20 years of experience providing directional drilling, utility excavation and fiber optic cable services across the Midwest, Ron has built Tharp Brothers into a successful company. This success is has been achieved by offering clients a variety of services and maintaining the highest level of workmanship and professionalism possible. In order to maintain these high levels of service, workmanship and professionalism, Tharp Brothers employs only experienced, courteous, well trained personnel. Along with quality, well-maintained equipment, Tharp Brothers prides itself on completing projects using the most efficient means possible without disturbing the day-to-day activities of the client or its customer base. As a representative of the client, Tharp Brothers' employees are trained to maintain a safe and professional work environment at all times, keeping the lines of communication open between themselves and any of the client's customers that may have questions or concerns about the project. 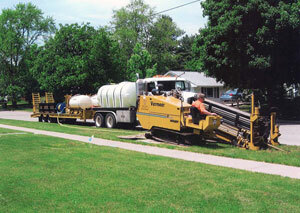 Along with the many underground utility services offered, Tharp Brothers, in its ongoing commitment to customer service, also provides project design and drafting services, offering assistance with project planning, design and estimating as well as the production of construction and as-built drawings. With over 20 years experience providing underground utility services, Tharp Brothers has worked in many of the Midwest states, namely Illinois, Iowa, Indiana, Missouri, Minnesota, and Wisconsin. Most recently, our company has completed FTTP projects for LaHarpe Telephone, Glasford Telephone, and New Windsor Telephone in Illinois. We are currently working with McDonough Telephone Company on several FTTP upgrades and service area expansion projects. Tharp's served as General Contractor for McLeod USA for several years. Major projects during that time included the completion of fiber rings from Beaver Dam, WI to Oshkosh WI and Austin, MN to Rochester, MN. Our company has placed bridge attachments on numerous bridges spanning the Illinois, Mississippi and Rock rivers. The Merchants [Railroad] Bridge at St. Louis is our largest project to date. Our snooper truck has been leased throughout the Midwest by railroad companies, engineering firms and others for bridge inspections, bridge maintenance and bridge repairs. Our mission is to provide our customers with the high quality of service that Tharp Brothers is known for, while maintaining a safe, professional working environment.